Brigadier General Paul D. Nelson serves as Deputy Assistant Secretary General for Intelligence, NATO Headquarters, Brussels, Belgium. General Nelson graduated from the University of Minnesota's Air Force ROTC program as a distinguished graduate in 1987. 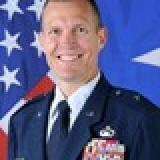 He served as a squadron, group, and wing commander. His staff duties include tours at U.S. European Command, Headquarters International Security Assistance Force (ISAF), Headquarters U.S. Air Force, Air Combat Command, and Air Force Intelligence, Surveillance, and Reconnaissance Agency.